Father, to honor you, St. Stanislaus faced martyrdom with courage. Keep us strong and loyal in our faith until death. Grant this through our Lord Jesus Christ, your Son, who lives and reigns with you and the Holy Spirit, one God for ever and ever. Amen. 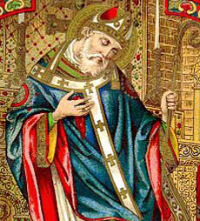 St. Stanislaus was the Bishop of Cracow, Poland. A champion of the liberty of the Church and of the dignity of man, he defended the lonely and the poor. When he reproached King Boleslaus II for his immoral life, the king himself killed him during Mass. He is the patron saint of Poland. Spirit of counsel and fortitude, have mercy on us. Litany of the Holy Spirit for the election of a holy pope. Stanislaus was born in 1030 and was educated at Gnesen and at Paris. After his ordination to the priesthood he was made a canon of the cathedral at Cracow as well as archdeacon and preacher. Upon the death of the bishop of Cracow, he was nominated bishop of the diocese by Pope Alexander II. The king at the time, Boleslaus II, trying to strengthen his own power, led an expedition against the grand duchy of Kiev, making himself very unpopular with the nobles of the country, who opposed his policies. St. Stanislaus of Cracow sided with the nobles, led by the king's brother, Ladislaus, and this brought him into conflict with the king. Stanislaus had opposed the king before for his tyrannical ways and once confronted him boldly for his immoral behavior when Boleslaus had abducted the wife of a Polish nobleman and carried her off to his castle. No one seemed willing to face the king from a fear of his rage, but Stanislaus boldly went to the king and threatened excommunication if he did not change his ways. Furious, the king promised revenge on the bishop. Later, Stanislaus sided with the nobles in their opposition to the king's political policies, and the king accused him of being a traitor and condemned him to death. At first the king commanded his soldiers to kill the bishop when he was celebrating Mass at St. Michael's chapel in Cracow, but the soldiers refused, fearing to bring down upon themselves the wrath of God. Undeterred, the king himself entered the church, drew his sword, and killed the bishop, ordering his soldiers to dismember the body. Patron: Archdiocese of Cracow, Poland; Poland. Symbols: Bishop being hacked to pieces at the foot of an altar. Sometimes evil has to be confronted boldly, whatever the consequences. Brave men like St. Stanislaus of Cracow risked death in facing evil. There is little chance today that we will ever be in that danger, but we must always be willing to defend the truth, and it should be very clear, in the face of genuine evil, where we stand. Christ our Lord can expect no less from us. Say an extra prayer today for the gift of fortitude. Learn a little more about the city of Kracow where both St. Stanislaus and Pope John Paul II came from. For those who are extremely interested in knowing more about Polish history this online book, Polish Americans and Their Communities of Cleveland may prove to be a good source of information. The final work of Franz Liszt is the unfinished oratorio St. Stanislaus, for which he left two scenes (one and four) and two polonaises. Learn more about this oratorio here and if you are able find a copy and listen. The Station at Rome is in the church of St. Apollinaris, who was a disciple of St. Peter, and afterwards bishop of Ravenna. He was martyred. The church was founded in the early Middle Ages, probably in the 7th century. In 1990, the basilica came under the control of Opus Dei.